Most of my time in Guatemala was spent in some type of forest or another, which is exactly how I like it. To me, the Neotropics are all about rain forests and cloud forests and the other assorted flavors of vegetation and altitude. But if you spend any time at all in the Petén region, you’re likely to become acquainted with Lake Petén Itzá, a very fine place indeed. This inviting karstic lake, clear water on a bed of bleached limestone, harbors all manner of waders and waterfowl such as the ubiquitous Northern Jacana, along with the kind of raptors and songbirds drawn to such shorelines. 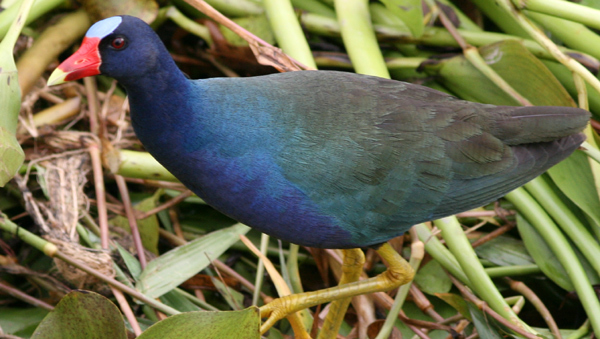 Have you seen a more beautiful bird than a Purple Gallinule? Our first stop in the Petén was the rather splendid Petén Esplendido Hotel and Conference Center in Flores. A lavish brunch was seasoned with the finest Purple Gallinules (alive of course) and served alongside a variety of herons, including Green, Great, Snowy, Tricolored, and Little Blue. Two days later, we returned to Flores by crossing the lake in a number of small ferries. It was during this crossing that I enjoyed an experience that perfectly crystallized how relative rarity and interest can be in birding. After an action-packed morning in Cerro Cahui, we were guests for lunch at Hotel Gucumatz, a wonderful waterfront location with docks, hammocks, and a rather dicey canopy platform! Well-fortified, our happy campers filled a number of small motorized skiffs to cross the lake and once again, fortune favored me with an auspicious array of fellow travelers. On board were Marco and Hugo, the (relatively) local birding hotshots with whom I toured Cerro Alux, Finca El Pilar, and Antigua, along with a bunch of other Guatemalan ace naturalists and my new best friend, Ana Cristina of INGUAT. The only other North American birder on board was artist Keith Hansen, as sharp-eyed a guide as I’ve ever encountered. Keith is extremely enthusiastic as well; despite leading a nine-day tour through Guatemala just a week before we met, he still hit every trail with infectious intensity. During the serene crossing, we spied the expected Neoptropic Cormorants and Anhinga as well as a profusion of Laughing Gulls and Mangrove and Northern Rough-Winged Swallows. Jacanas, gallinules, Common Moorhens, American Coots, and Black-necked Stilts worked the reeds along the shore, all fine species to be sure but nothing I hadn’t seen before. A flock of Lesser Scaup overhead deepened the sense that maybe I could ease back on the throttle a bit. This is why I didn’t make a big deal about a lone duck bobbing up ahead. It looked like a scaup species or close relative and since I’d mostly closed out American Aythya ducks at Cold Spring Harbor in February, I resumed scanning the tall grass for bitterns. Big mistake on my part! Once my compatriots got an eyeful of this duck, the energy level on our skiff spiked. Who’d have guessed that these paragons of Guatemalan bird watching had never seen a Ring-necked Duck before?!? Everyone on board was having a high time analyzing this duck, everyone that is but me and Ana. Scopes were balanced precariously, field guides were flying, and Keith was emphatically identifying each diagnostic field mark. Our toothless skipper even circled around to provide a closer look. There I was, straining for a look at something new, even a measly Bare-throated Tiger Heron (OK, they’re far from measly) yet my fellow passengers were exulting over their life Ring-necked freaking Duck, a drab female at that! 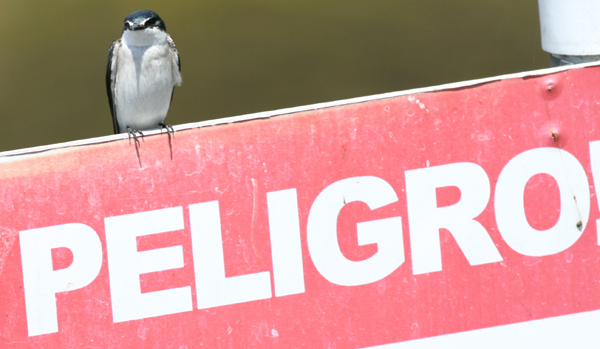 And that palpable excitement, my friends, is what is RIGHT with birding. The fact that every bird is worthy of scrutiny and respect, that even the most mundane outing might hold surprises, and that sharing someone else’s life birds can be far more satisfying than racking up your own convinces me of the enduring excellence of this avocation. 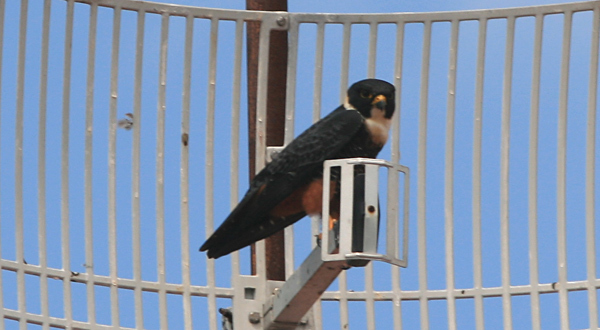 The ferries dropped us off in Flores for beers and Bill Thompson’s birthday Bat Falcon, a thoughtful gift indeed. And then all too soon, we had to leave. You see, I had a plane to catch, a professional obligation that pulled me all too soon from this phenomenal Guatemalan International Birding Encounter. Of course it hurt to leave this beautiful country, those beautiful birds, and my fellow explorers (such nice personalities!) especially since the group would soon be taking on Tikal. My only consolation was that I was en route to check out some new U.S. birding spots, including a couple I can’t wait to describe. But I’ll never forget this trip of a lifetime and I don’t ever think I’ll forget that Ring-necked Duck on Lake Petén Itzá. Great tale Mike. Reminds me of that moment of sublime birding I told you and Corey about when I was birding Long Beach years and years ago (in 1991 actually) and my two companions (who’d been kind enough to pick me up and take me birding) were stunned by the fact I’d just id’d a Magpie out the car window ( a bird I regularly saw in my garden at home). They were incredibly excited, I was incredibly looking for seaduck…takes all sorts eh? Yep. Now I have the theme song to batman stuck in my head and I am now annoying my co-workers by humming it. Hopefully Mike you can return the favor by inviting all those birders up to NY, where you can discover a Bat Falcon in Central Park and have everyone else go ho-hum!